Located directly across the street from Kamaole Beach III, you can enjoy the fabulous sunsets sipping MaiTais from our huge lanai. Unit 407 is located directly above the swimming pool and offers many hours of relaxation. Just a short mile from Wailea, you can enjoy luxury shopping or visit the nearby ABC store for souvenirs. If you want relaxation, this is the place. Golfing? We have golf clubs for your use. Snorkeling, boogie boarding? Just stroll across the street to one of the best beaches on Maui, well-known for its turtle sightings. We live in Bothell, Wa. Married since 1967. We have two grown children and 5 grandchildren. We are now retired and love to golf and travel. We chose this location because we love Maui. Roger was raised here and his whole family lives on island. I love the sun, the pool, and the sand and Roger loves to go hunting with his family and friends. We both like to golf but only in fair weather. We can golf year-round in Maui. We never considered buying anywhere else. Located directly across the street from Kamaole Beach III is a definite plus. We only have to cross the street to swim in the ocean. 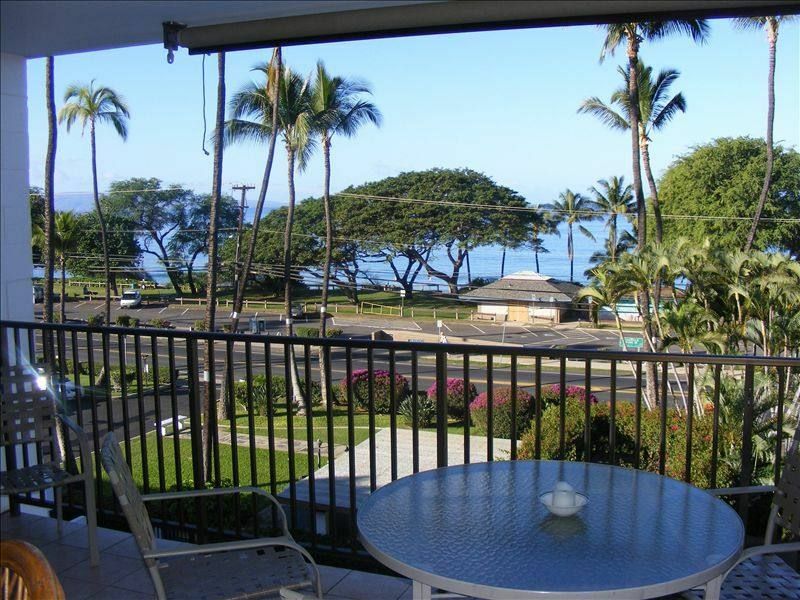 We can enjoy sunsets right from our lanai and our ocean view is one of the best in Kihei. We can walk to restaurants and shops and golf courses are only minutes away by car. Since we are located on the fourth floor, we can leave our lanai doors open all night and be secure. Directly across the street from Kamaole Beach III, this unit offers spectacular sunset views, ocean views, and people watching. all linens for both bedrooms provided. larger capacity front load washer located in unit, purchased in 2012.
located in our unit, purchased in 2012.
high speed internet with free long distance to the U.S. and Canada. tropical print sofa and 2 recliners, flat screen TV. Fully furnished with all dinnerware and silverware. Loved the location and the view from the Lanai is incredible. Condo was very well equipped, chairs, boards, towels, cooler. Made the whole stay effortless and relaxing. Thanks again and look forward to staying here again. thank you. We try to keep our condo well stocked for our guests' enjoyment. After a last minute issue with the condo, Carrie was able to find us a different condo in the same building. We really appreciate all that she has done for us. Great location, very clean, awesome place to stay! We stayed here for 10 days and the location is great. Its right across the street from the beach, we would come back and eat lunch then head back to the beach, less than a minute walk to the beach. Very clean and everything worked great as well. Some days we sat by the pool as well, which is never too packed. I would definitely recommend staying here :). Thanks for the great review. We really try to make our guests as comfortable as possible. This condo is great! Location is great! It had everything we needed (kitchen was stocked, beach chairs, towels, etc.). I would easily recommend and/or stay here again. We had a wonderful holiday here with our young adult sons. Our favourite part was the large lanai which could be opened up to include the kitchen and living room space. The fast Wi-Fi and nice-sized TVs were a hit with the boys. We were especially thrilled with how well-stocked this condo is and enjoyed the beach chairs, the boogie boards and the Keurig coffee maker. We watched whales and sunsets from the balcony and dreamt of coming back to this condo on a consistent basis. Kamaole Beach offers whale watching, snorkeling, sunbathing, swimming, and catching waves on your boogie board. Located a short distance from several golf courses, snorkle cruises, and fishing charters. Across the bay from the Maui Aquarium. Within walking distance of shops and restaurants, with a bus stop in front of our condo complex to connect you with other parts of the island. A great place for a daily morning walk to breakfast or a leisurely stroll on the beach.